Who’s got the worst fans in college football? Oregon State Police have arrested UO student Joshua David Britton in connection with the turf burning at Reser. A shot at the national title isn’t enough; let’s burn this mother. After the Civil War game at Reser Stadium in Corvallis, a few fans decided that clinching a spot in the national title game wasn’t enough. Indeed, it was time for some good old theft and vandalism. First, the Lee Corso mascot head disappeared from ESPN’s College Game Day headquarters at the Oregon State University Memorial Quad. ESPN correspondent Erin Andrews circulated Tweets asking for the thieves to return the head shortly after news broke of the incident. The head was found in Harrisburg by an OSU professor the day after it was discovered missing. The head is worth $5,000. So there you have it. 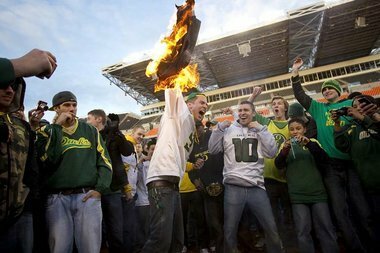 The first time an Oregon team has made it to the national championship game and this is how our fans choose to celebrate. Classy.